Hello friends and spellslingers, welcome back to EDHREC and our continuing biweekly column, Non-Basically Speaking, the series that strives to identify non-basic lands that should be considered valuable staples or hidden gems based on their visibility on EDHREC. In our last episode of non-basically speaking we jammed three of Ixalan‘s new double faced artifact-to-land cards into an interesting mono-white Balan, Wandering Knight equipment deck. It was a tasty recipe that combined a new commander from C17 with goodies from the on-deck set of Ixalan. Today, I want to repeat our formula and focus on another intriguing double-faced card from Ixalan: Primal Wellspring. It seems that the dominant side of this flip land, Primal Amulet, would be most effective in a deck that runs primarily on instants or sorceries, known in Magic lingo as a “spellslinger” deck. While there are plenty of suitable commanders, as evidenced by over 2,900 parsed decklists on the EDHREC Spellslingers Theme Page I have decided to, once again, hire the services of a fresh face in the community and take a look at Kess, Dissident Mage. Before we begin, we should take a moment to acknowledge the fact that Kess, Dissident Mage can be built in a competitive fashion. Strategies such as discard, storm, or combo might be a bit more beneficial if our playgroup and meta come in with guns blazing. However, in today’s article I want to stay on the casual side of the isle and cram a healthy portion of removal, draw, control, and steal cards that, while effective, might be a bit over-costed or high on the mana curve. But, with Primal Amulet and similar cost reduction cards, we should be able to balance things out a bit and sling some impressively large spells around the table. If we factor in Kess’ ability to allow us to cast our haymakers a second time, the value of our spell-heavy Commander deck should start to take form. With this in mind, it’s time to make our shopping list and head to the store to buy the ingredients for Kess, Discount Mage! Costs Reduced! Enjoy the Savings! Why not begin our evaluation with the card that inspired me to piece together a spellslinger decklist in the first place? Primal Amulet is a cost-reducing artifact that provides us a discount on our instant and sorcery spells. While putting our spells on sale for one less generic mana is a decent bargain, we should also mention that the savings continue when Kess, Dissident Mage casts a card out of our graveyard. For example, with Primal Amulet (0% of decks) online we can cast Impulse for just one blue mana. If we have Kess, Dissident Mage in play, we can then cast Impulse (41% of decks) again, for the same low rate of one blue mana. Now that we have identified the value, we should also mention that both spells will add a charge counter to Primal Amulet putting us within two of flipping the card and finding the Wellspring we have been looking for. In addition to Primal Amulet we have a handful of cards, like Jace’s Sanctum (55% of decks) and Baral, Chief of Compliance (71% of decks), that will offer identical savings or take an additional amount off of the retail casting cost of the card. 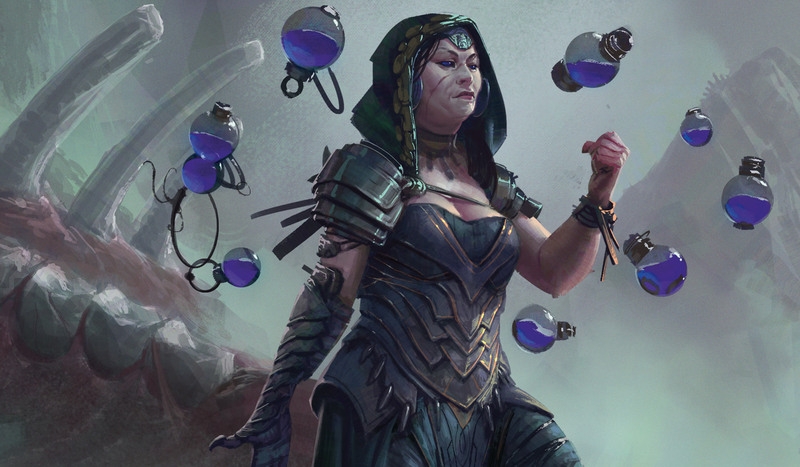 With our plethora of mana rocks and cost reduction effects, hefty mid-range spells like Saheeli’s Artistry (0% of decks), Aethersnatch (0% of decks) and Silumgar’s Command (16% of decks) become a bit more plausible. While the cost reduction is nice, it is the flipside of this dual faced card that should bring home the bacon. But, before we dive into Primal Wellspring let’s explore possible win conditions for our Grixis spellslinger deck. While most of our game will involve mid-ranged control spells, board wipes and the occasional shoplifting of a card owned by another player, we must not lose sight of the end game. Keeping our life total from going bankrupt and casting board wipes once from our hand and again from our graveyard using our commander’s ability will be essential to put ourselves in a position to win. Our closeout deals are found at the top of the mana curve in the form of monstrous tide-shifting spells not currently represented on Kess’ EDHREC page: Clone Legion, Expropriate, and Insurrection. Obviously, these three bargain bombs play much better in a creature-heavy playgroup where we can exploit the number of players or the number of creatures on the battlefield. The fireworks of an enter-the-battlefield (ETB) stack created by Clone Legion or using a saturated battlefield to stampede our opponents with Insurrection should do the trick. Expropriate, on the other hand, might steal enough extra turns or permanents to lock the game up for good. Of course if at first we don’t succeed, our Grixis gal will give us access to the graveyard so we can fire off another round of previously used spells. Along the way, I wouldn’t be a bit ashamed to blast a creature-heavy board with a Rakdos Charm (29% of decks), steal a fat Eldrazi with Bribery (0% of decks) or kick a Rite of Replication (18% of decks) on a worthwhile target to get the job done. Heck, even Metallurgic Summonings’s (22% of decks) robot army of X/X constructs could provide a win out of nowhere if we play our cards right. While a clone army or healthy supply of extra turns are valid options to bring a game closer to the finish, our main win conditions probably rest upon the value of our “X” variable when we cast Exsanguinate or Torment of Hailfire. Either one of these two cards can pummel an entire table and have the possibility of being cast more than once with Kess in command. With possible win conditions set, it is finally time for our deal of the week! If we use mana siphoned from the Primal Wellspring to cast an instant or sorcery, we are blessed with an additional copy of that spell. While the value provided by our copy land is obvious with some of our early to mid game spells like Acquire or Plea for Power, the Wellspring could bring absolute destruction to an opponent if we use it on a juiced Torment of Hailfire or Exsanguinate. Pondering the ability to duplicate these X spells once and then on our next turn use Kess to cast and duplicate them again should get the saliva flowing for a feast of life loss. Left uncountered, very few opponents can withstand four iterations of this arcane power. In epic storylines we could tap Primal Wellspring to float a duplication mana, cast Frantic Search (52% of decks) to untap the Wellspring, and then tap it again to float another duplication mana. This little trick nets us two copies of the instant or sorcery we cast using mana from Primal Wellspring. Imagine a kicked Rite of Replication utilizing the double-mana-juice on an opponents Avenger of Zendikar or Inferno Titan. Of course I realize that getting a Primal Amulet flipped and having a Primal Wellspring online will be difficult to accomplish. For this reason, I included Swarm Intelligence (15% of Decks) and Increasing Vengeance (29% of decks) as potential backup plans. While the overall strategy of our Kess Spellslinger EDH Deck is in focus, I thought it worthwhile to speak non-basically for a quick second. Most EDH deck builders would agree that if we run win conditions like Torment of Hailfire and Exsanguinate we would be remiss to not include Urborg, Tomb of Yawgmoth (37% of decks) and Cabal Coffers (0% of decks). This infamous duo are well known for their ability to generate massive amounts of bubbling crude designed to fuel game ending spells and strategies. Finally, we have to give a nod to Thespian’s Stage (0% of decks) as a card that could copy our Cabal Coffers, serve as a tri-land if we turn it into a Command Tower, or win the jackpot by turning it into a second copy of Primal Wellspring. That’s all I have for you today my EDHREC friends! I’ll have to be honest, I have never made a spellslinger deck before. With that being said. How did I do? What advice can you give me to make this deck run a bit smoother? What janky, oddball selections were you surprised by? What are your plans for Primal Amulet? Let’s discuss in the comments below!